Small 4 Style: GlamST... It's Virtual Makeover Time! GlamST... It's Virtual Makeover Time! The new GlamST app is going to knock your fake eyelashes off. 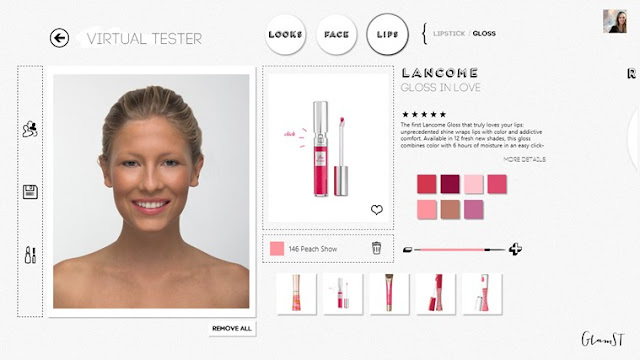 This latest innovative will allow beauty queens like you to upload your photo, learn about the latest beauty trends, and virtually try on face and lip products from your favorite brands. Imagine yourself at your favorite luxury makeup counter, overwhelmed by the rich lipsticks and the scent of posh perfume. Trust me, I've been there and it can be difficult to resist getting caught up in buying every product the salesperson shows you. Sometimes, buying makeup can be risky. You never know how your new makeup will look on you until you take it home and experiment. And once you spend a lot of money on the makeup that doesn't meet your expectations, you're stuck. Luckily, you don't have to fall into this trap again with GlamST. Whether you're searching for a new look or just want to have a little fun, GlamST sounds like a brilliant idea. If you have Windows 8, download the app at the Windows store today. This December, GlamST will be available for every platform. Sign up for email updates on the launch of the new web app on the GlamST website. Once this comes out, I'll be one of the first to try it out!